Are you an entrepreneur or an independent professional in the Tampa Bay area? Are you considering working in a collaborative setting? We hope so! Self-employment is on the rise and while having a private office has it’s own advantages, the benefits of using a coworking space are plentiful. Coworking offers collaboration and synergy. Some of their many benefits include a flexible, convenient, and professional work environment that encourages productivity. Coworking spaces are ideal because of their lower cost, networking opportunities, flexible schedules and a wide array of free amenities that are included. 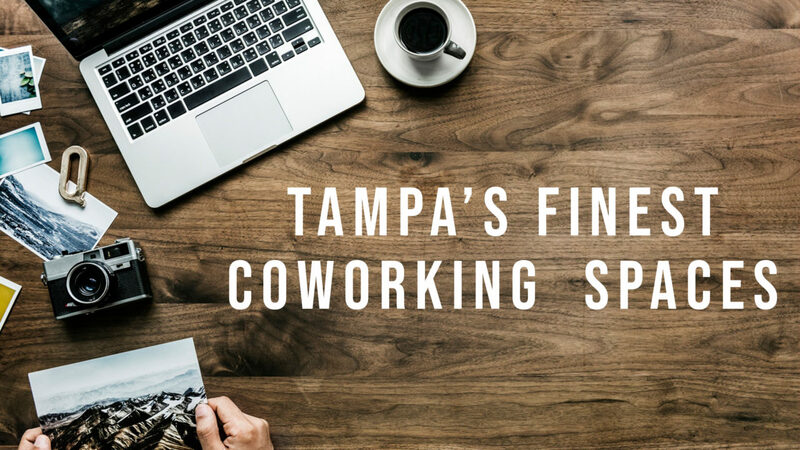 We gathered our top 5 favorite coworking spaces in Tampa and listed them here! Tampa’s hottest new premier community destination, Armature Works, includes exclusive cowork space and private offices as well. Located on the second floor of Armature Works, Bay 3 offers 11,000 square-feet of collaborative space with unobstructed views of the Hillsborough River. Bay 3 is the perfect place for creative inspiration as it is at the heart of historic Tampa and attracts both locals and visitors from far. Feeling hungry while working? No problem, Armature has 14 different food vendors located on the first floor. Widely trusted around the country at its many locations, the Tampa location is nestled in the heart of downtown Tampa. Industrious Tampa has panoramic views from the 33rd floor of the SunTrust Financial Center. This Premium coworking space offers private offices or shared coworking spaces. They have some serious membership perks that include access to a fitness center with showers and bike storage. Industrious has been nationally recognized by Forbes, The New York Times, The Wall Street Journal and other credited journals. Currently, in downtown St. Petersburg, this local beauty is expanding to Hyde Park and will be completed by spring 2019. Members have 24/7 access to coworking spaces and can take advantage of affiliate discounts, discounted or free admission to community events held in the space, or simply enjoy food, drinks, and entertainment. One of our favorite features about Station House is their variety of conference rooms that are available for rent. From a chic classroom to a posh library-inspired conference room, to an iconic lounging area, Station House has it! More than just a coworking space, Station House is a cozy and inspiring “hip epicenter” for anyone looking to connect socially or professionally. The Tampa Bay Wave community is a non-profit organization, unique for specializing in helping build, launch and grow tech companies. Not only do they offer cowork space, but also mentoring and funding opportunities for its entrepreneur members. Since 2008, Tampa Bay Wave has motivated and supported over 150 tech startups and 250 entrepreneurs. With over 70 mentors in the Wave network, their Tech Accelerator programs are sure to help business flourish. Over the years, they have developed proof from multiple success stories! Additionally, as a member, you will have access to all Wave events and other resources that help connect like-minded individuals to spark innovative ideas and share tech insights. Last, but most certainly not least is CoCreativ! This cutting-edge cowork space has not only one location but two! In addition to cowork space, this company offers GeoTargeting services, same day setup and move in, and on-site concierge to assist you. CoCreativ offers a wide variety of membership plans and promotes their risk-free guarantee. A unique feature of CoCreativ is their exclusive 100k Club for members who increased their annual revenue by $100k+ during their time at CoCreativ. Also, they offer a referral program that could earn you a free membership! Here at ADventure Marketing, we work creatively, collaboratively, and professionally. As one of Tampa’s most creative marketing agency’s, we stress the importance of working collaboratively and effectively. If you are looking to collaborate on ideas and strategies for your social media plan, content creation, or website building, please contact us today or come visit us at the University of Tampa’s collaborative space at the Lowth Entrepreneurship Center! The Lowth Entrepreneurship Center develops innovative and qualified business leaders with the skills to make their visions a reality.